280 pages; 9 b&w illus. 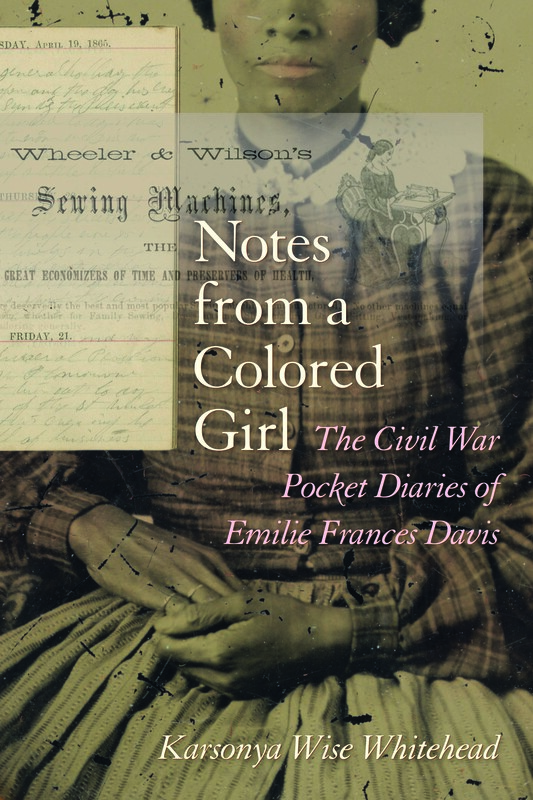 In Notes from a Colored Girl, Karsonya Wise Whitehead examines the life and experiences of Emilie Frances Davis, a freeborn twenty-one-year-old mulatto woman, through a close reading of three pocket diaries she kept from 1863 to 1865. Whitehead explores Davis’s worldviews and politics, her perceptions of both public and private events, her personal relationships, and her place in Philadelphia’s free black community in the nineteenth century. Although Davis’s daily entries are sparse, brief snapshots of her life, Whitehead interprets them in ways that situate Davis in historical and literary contexts that illuminate nineteenth-century black American women’s experiences. Whitehead’s contribution of edited text and original narrative fills a void in scholarly documentation of women who dwelled in spaces between white elites, black entrepreneurs, and urban dwellers of every race and class. Whitehead delineates a narrative that grapples with the complexity of a free black woman’s lived experience during the Civil War. In the book, readers will have the opportunity to see how a historian takes a critical perspective to resurrect a black woman’s writing from a time period when their writing was limited and repressed. In this sense, readers can see how Whitehead is generating knowledge about the black female experience by developing and situating the narrative as part of a limited cannon of detailed personal accounts that describe the lives of everyday free black women during the Civil War. Additionally, by transcribing and reconstructing the life of Emilee Frances Davis, Whitehead provides an opportunity for readers to position Notes alongside other texts and engage in comparative analysis and interpretation that explores, for instance, the history of black Philadelphians and / or the diverse experiences of black free women during the Civil War. What were the dominant social scripts about black women during the Civil War? How do Emilie’s diaries, as a public record, challenge and / or affirm the social scripts and narratives written about black women during the civil war? Although Emilie enjoyed certain liberties as a free woman, in what ways was she still unsafe as a black woman living in the Philadelphia? How did racial, gender, and economic inequality work through institutional structures and social practices in Philadelphia during this time period? How might the reconstructed life of Emilie Frances Davis be different if it were written from the gaze of a white male perspective in contrast to a black female perspective? In what ways might Whitehead be working to disrupt the collective imagination about black women during the Civil War? How does Emilie’s life disrupt, challenge, or confirm understandings of black women as intellectuals during the later part of the nineteenth century? How does Emilie Frances Davis, the pocket diary writer, push contemporary understandings of who can be knowledge generators? How is shame experienced in raced, classed, and gendered ways in Emilie’s pocket diaries? How did power relations between men and women, and between women, shape Emilie’s lived experiences? How, if at all, does Emilie express a sense of cognitive dissonance between her life as a free woman and the lives of enslaved women during that time period? How does Emilie read and understand how inequality shapes her life? How, if at all, does she analyze social problems and take action? How did Emilie’s social community help her navigate obstacles? How did she negotiate her collective and individual identities? • Education—B.A., Lincoln University, PA; M.A., University of Notre Dame, Indiana; Ph.D., University of Maryland, Baltimore County, Baltimore, MD. Dr. Whitehead is assistant professor of communication and African and African American studies in the Department of Communication at Loyola University Maryland; a motivational speaker; a Master Teacher in African American History; a curriculum writer and lesson plan developer; an award-winning former Baltimore City middle school teacher; and, a three-time New York Emmy-nominated documentary filmmaker. Dr. Whitehead was selected to participate in the 2013 and 2014 Black History Month Panel sponsored by President Obama and the Association for the Study of African American Life and History (ASALH): in February 2014, she was selected to moderate the panel on “African Americas in the Armed Services” and in February 2013, she was one of four experts selected nationwide to present on the topic of “At the Crossroads of Emancipation and Freedom.” Dr. Whitehead was also one of several feminist scholars selected to present at the 100th Anniversary Harriet Tubman Symposium at the University of Albany. She has received various fellowships and grants to support her work including a 2012 Gilder Lehrman Fellowship in American History and a 2010 NEH Summer Stipend. She was recently selected as one of the top 25 women professors in Maryland by Online Schools Maryland; and she received the 2013 Loyola University Maryland’s Faculty Award for Excellence in Engaged Scholarship (presented to only one faculty member per year). Whitehead has also received the 2006 Gilder Lehrman Preserve America Maryland History Teacher of the Year Award (sponsored by the Gilder Lehrman Institute of American History and the Maryland State Department of Education); was one of fifty alumni to receive the Distinguished Black Alumni Award from the University of Notre Dame, Indiana (2005); and, was a winner of both the Langston Hughes, David Diop, Etheridge Knight Poetry Award (1999, 2000) and the Zora Neale Hurston Creative Writing Award (1998) from the Gwendolyn Brooks Creative Writing Center at the University of Chicago. Dr. Whitehead has served as the Historical Consultant for a series of Emmy-award winning documentaries on Philadelphia; the guest editor for the 2014 edition of ASALH’s Black History Bulletin; and the Historical Content Editor for Red Lion Press’ Children’s Historical Fiction Graphic Novel Series, released in Fall 2010. She has worked with over 2500 K-12 teachers throughout the country through lectures and workshops throughout the country, training them in how to become culturally responsive teachers in diverse environments. She wrote and helped to create Cr. Camille Cosby and Renee Poussaint’s Civil Rights Movement website With All Deliberate Speed and has written lesson plans for schools, museums, and cultural centers; and state and local history curriculums. Dr. Whitehead is the author of three books: Sparking the Genius: The Carter G. Woodson Lecture (Apprentice House 2/14); Notes from a Colored Girl: The Civil War Pocket Diaries of Emilie Frances Davis (USC Press, 5/14); and The Emancipation Proclamation: Race Relations on the Eve of Reconstruction (Routledge, 10/14); and the editor of The Emilie Davis Companion Reader (Apprentice House, 5/14). Dr. Whitehead is also an internationally renowned motivational speaker that has spoken to adults, teenagers, and children around the country, a prolific blogger, and a frequent guest on radio and television. Dr. Whitehead is also a wife and a mother of two teenage boys. *BookClub discussion questions were developed by Conra Gist. “A Black Feminist Translation: Reading Life, Pedagogy, and Emilie” in The Emilie Frances Davis Companion Reader, (Apprentice House: Baltimore, MD, 2014): 15-16.
from → Materials for "Notes From a Colored Girl"
Another book to add to my summer list. I cannot wait to read the book. It is refreshing to see tales of the Civil War told from an African American perspective.